Caffeine is a bitter compound present in coffee, which primarily affects your metabolism, particularly the central nervous system. Generally, the caffeine content of coffee is not harmful if you consume it in moderation -- no more than two to four cups per day. If you have a sensitivity to the substance, however, you may opt for the decaffeinated version, although the caffeine content may be more than you think. Whether you’re curious about the level of caffeine present in your coffee, or you need to measure it to safeguard your health, caffeine testing is a simple process you can do quickly and efficiently. You just need to have the proper testing strip. Purchase caffeine-testing strips at your grocery store. If you cannot find them, buy them online from a reputable seller. Generally, a package contains 20 strips, and may be up to 98 percent accurate in determining the caffeine content of coffee, according to an October 2009 article published in "Popular Mechanics." Pour 6 oz. of black coffee into a cup and then place the strip inside. 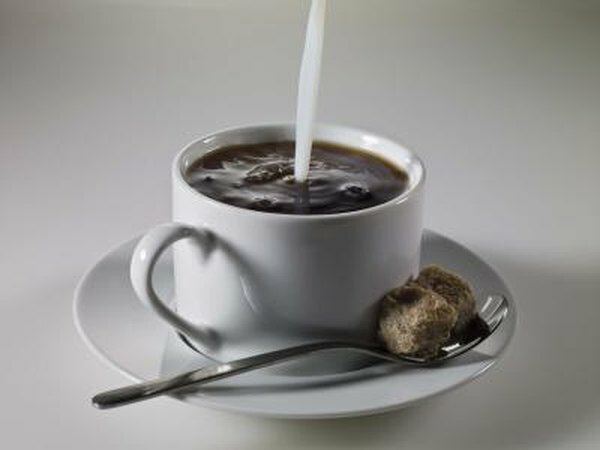 The testing strips are not able to determine caffeine content in coffee mixtures, such as lattes, which contain sugar and milk. Caffeine-testing strips require the coffee to be black for an accurate measurement. Remove the strip from the coffee after it has finished soaking, about 30 seconds, and place it on a flat surface. Find the lines of the strip, which hare marked either “D” or “C.” If a drink has more than 20 mg of caffeine, the “C” line will appear bolder. If the drink has fewer than 20 mg of caffeine, the “D” line will appear bolder. Generally, decaf coffee may contain between 6 and 10 mg of caffeine per serving, which fits the requirement of a “decaf” label. In some cases, however, the caffeine content may be well over 30 mg.
Re-test your coffee if you were unable to get a clear reading. This may happen when the caffeine content is close to 20 mg. If this is the case and you are sensitive to caffeine, avoid drinking the beverage.